With its big, bold, Hollywood style, the beautiful HOLLYWOOD collection from Paris Hilton comes in black, silver metallic, and gold metallic. The bold numbers at the 12, 3, 6 and 9 o’clock positions are adorned with silver glitter. 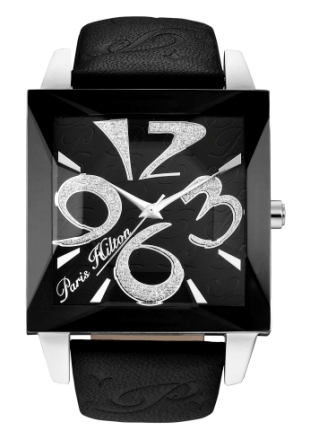 The leather strap is stamped with the well known Paris logo design. The beveled mineral crystal adds to the fabulous look — making YOU the star!